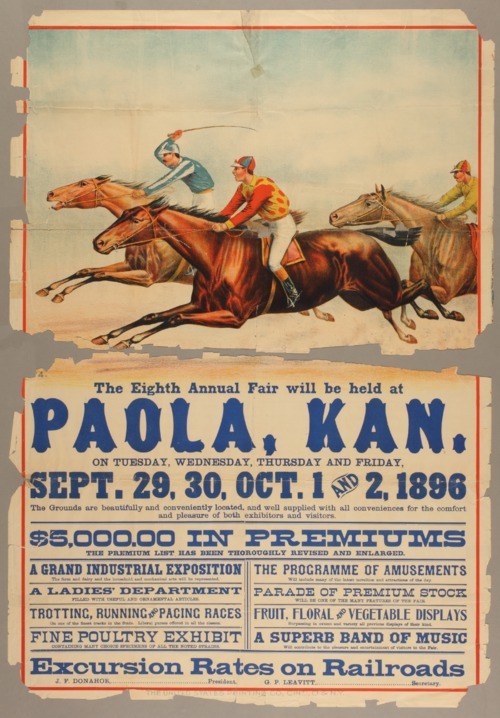 Horse racing is featured on this Paola, Kansas, fair poster. Attractions at the fair include a grand industrial exposition, a program of amusements, a ladies' department, a parade of livestock, horse races, a poultry exhibit, live music, and fruit, floral, and vegetable displays. Fair officers are J. F. Donahoe, president, and G. P. Leavitt, secretary. Creator: United States Printing Co.